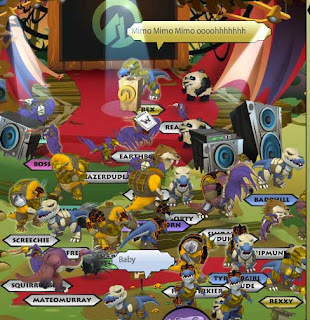 Club Penguin Cheats by Mimo777 Club Penguin Cheats by Mimo777: Webosaurs Mimo Party, MVA Review and a Funny Story! 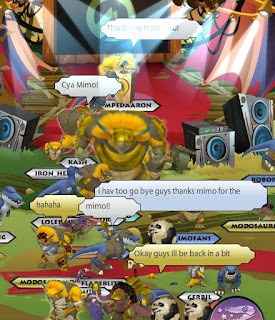 Webosaurs Mimo Party, MVA Review and a Funny Story! I would say there are only a few virtual words out there that update and add as much stuff as Webosaurs! It's crazy! As you know I had a rockin' cool Webosaurs party last week end. You were there, ya I saw you, You rock. Then came the MVA awards! So many of our friends won an award. Rex was handing out the awards and I was cheering everyone on AND THEN Rex had me come on stage and sing a song! It was sooo funny! I didn't know what to say so I sang a little "Hey soul sister!" ROLF! Then I get off stage. Rexx laughed at me. It's all good. But very funny and we call had a pretty great time! You can check out all the big wieners and their videos here. Check out Webosaurs now and all their coolness. Oh wow, Mimo! That's so funny! hey i was at the party (Flare blitz) and i didnt get a chair! I love that song! HAHAHAHA! This is the best burrito I've ever eaten... Yum, yum, yum! With plenty of beans! And plenty of cheese! and plenty of rice. Oh, isn't it nice? Really really realy really really (get the point?)funny. Rexxy's got the bieber (mimo?) feaver! hey soul sister. hey that mister mister on the radio, stario, the way you move ain't fair ya know. LOL! I really wanted to come but I was going to sleep over at my friends house so we could make a movie the next day. Really wish I could have come. Oh well maybe next time. for two seconds then does the same roll back to where you were two seconds before and your name and the blue circle around your penguin stays put when u do the roll !!! Hey Mimo u can do a cool trick when u have all the elite gear, you get to do a sideways roll then u kneel down one knee for two seconds then roll back ! and ur name and the blue circle around your penguin doesn't move! Ha Ha, thats hilarious DMA0712! Bieber (mimo) fever. ROFL, I literally can't stop laughing. I mean it ...seriously. Now you got it stuck in my head. you should have sang zebras smell funny! You mean the Pumpkin Igloo? It's not out yet. I don't know if CP will add it, but new furniture will come out on the 15th of October! Thanks for telling us jasfriend1 , if mimo posts it he should give you credit ! Good Luck ! Greetings from Mexico, Manic0! To get the pumpkin igloo on Club Peguin, simply turn you Igloo Upgrades catalog to the third page. Click on the lights on the ceiling on the Gym Igloo. I love this post! I cant stop laughing at your funny story. Bye for now. Waddle on!